If something that really makes one look at certain reputed media with the eyes of suspicion then it is for their blatant play of double standards. The double standard itself is disgusting. The integrity of the service is greatly compromised here. When such unethical trick is played at the cost of humanity then the consequences could be very disastrous. This could steadily push the society into the sea of frustration. Thereafter the social anarchy! This glaring aberration in the world of media is visible as clearly as stars in the darkness of the night. Those who are suffering from a varying degree of mental glaucoma may fail to see it. Have we not witnessed that media fraternity often sets off the alarm bells when the victims of the crime instances are from a “particular community” but it maintains a “brutal silence” when the perpetrators are those it considers minority or Muslim? Yes, the particular minority are eternally beloved, so they are blameless. Even the traitorous terror-makers from the minority are unblemished to such media folks and a major group of columnists associated with the media. That’s why such elite media and its associates zealously stand up to sympathize with terror-sponsored stone-palters in Kashmir, a bunch of secessionists in the academia and so on and so forth. No wonder if one who sings Vande Mataram then he certainly stands to lose the support base of such media, no matter how influential he is, no matter how dedicated and truthful he is. So, I humbly advise any active citizens, particularly those who want to serve the country, not to utter this jingoistic phrase when alone. Better not at all. On the other hand, if you roar – ‘Bharat ke tukde tukde’ or ‘Pakistan zindabad’, which are heard more aggressively and more frequently these days, then all defensive forces become hyperactive to safeguard you. These subversive activities by any brats will be soon celebrated and interpreted as a part of the fundamental right that is ‘freedom of expression’. 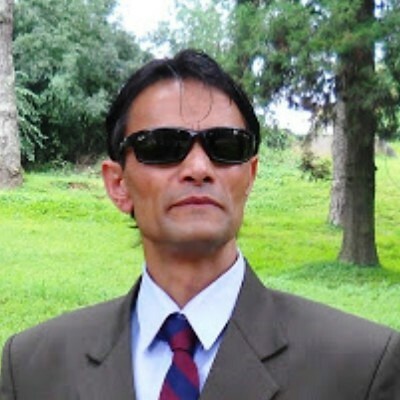 Have we not noticed in Kashmir where CRPF or other security personnel receiving humiliating bashings, the video clips of which often go around on WhatsApp, from the local? And in case the bold security personnel retaliate then those elites from their armchairs thunder that the democracy in the country is under threat? The majority are attacking the minority, blah, blah, blah..! I believe everyone knows how certain so-called student leaders often openly incite their unruly crowds at JNU and other academic institutes. But when the questions of sedition are raised against them then the media comes forward to denounce the government. Kanhaiya Kumar, Umar Khalid, Anirban Bhattacharya, Shehla Rashid Shora, Jignesh Mewani… are lovable sweeties to those intellectuals because their treacherous adventures make them more cheery and lustier. Each anti-nationalist “scream” by these jerks never get wasted. It is systematically used to degrade the nation, demean the culture and denigrated the religion. Till some years back college ruffians were nonentities but now they are held all of a sudden as leaders and opinion makers. These dangerous creatures are applauded and discreetly advised how best to go about. Many national political leaders as well jump to embrace and defend these troublemakers. But, on the other hand, the same warmth, attachment, and love are not at all showered upon any patriots by any mainstream media. So, citizens who want to sincerely endeavor to bring peace in the country are not at all given any platform, nor encouraged. Rather, the nation’s lovers are intensely scoffed at. They are non-existent, nay subhuman, to the pseudo-secularists. Of course, those people, often branded as ‘bhakts’, are aptly dragged only to paint them with bad colors. This Republic Day brought a great grief to many. A 22-year-old student - Chandan Gupta of Kasganj, UP, was heartlessly murdered, his crime being his participation in the ‘tiranga yatra’ singing Vande Mataram. No noticeable outcry of condemnation from any influential elites. 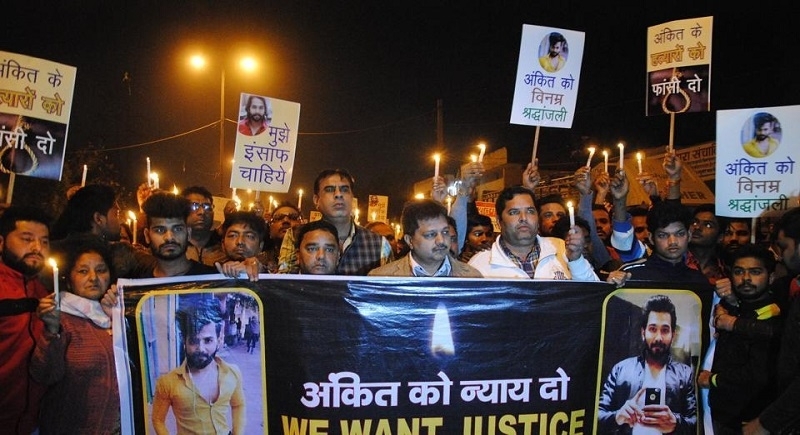 Again, Ankit Saxena, a photographer who loved a Muslim girl, was attacked, and girl’s relatives silt his throat in cold blood. Most of the media carried the news as “honour” killing as if it was in some way justified. What would have happened if the same heinous crime was perpetrated by the majority? It would have been Dadri-2. In another monstrous incident, a BJP party worker Santosh was stabbed to death in Karnataka. The killing of patriots is too frequent in Kerala. But no ‘award wapsi gang’ gets ever freaked out at the news …! The West Bengal Chief Minister Mamata Banerjee is welcoming Rohingyas and Bengaladeshi Muslims by spreading the red carpet. But no intellectuals have gone insane. Yes, the brutal attacks upon the majority are a very regular phenomenon. But what is “very less known” to the whole general public is that over 95% of such gruesome attacks, and also various kinds of sexual atrocities upon females of the majority, are “not at all reported”. Only those which can’t be suppressed get published. But they usually die down well before the dead bodies begin to rot. Well, no scream of criticism, no alarm of “intolerance” is ever raised by any over-conscious citizens when the people from the majority are killed. No media panel discussion ever called as in otherwise cases. Nor even the condemnation of the “onslaught on the humanity” ever heard. Well, had there not been a double standard in reporting the attacks on the “humanity”, if ever the ‘freedom of expression’ is truly valued, such barbaric perpetrators, no matter which community they are from, would not have at all reared their ugly heads. Is it not probable in near future that those beloved villains might “double-cross” and pose continuous threats that would toll the death nail for the double-tongued journalism, apart from the majority! The prelude to that situation is double clear now than ever before. Lastly, please note, none of the horrendous crimes by the particular community ever become a “Dadri” --- the stench of which is still being felt by our depraved columnists. Is this not a part of the grandiose scheme? The situation is dangerously ominous! 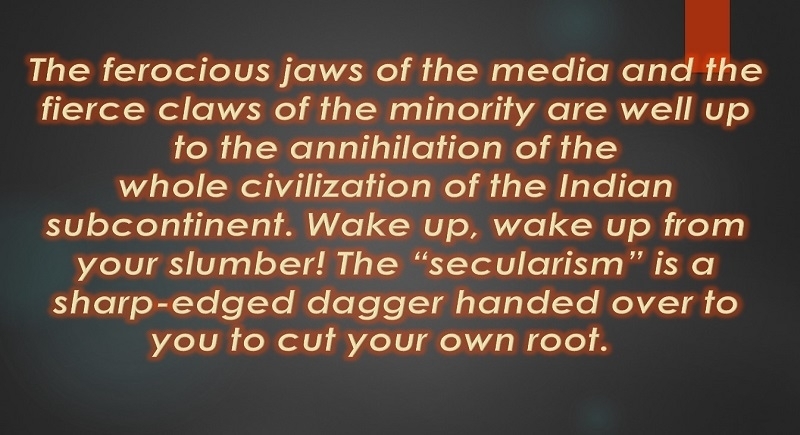 I’m afraid, it’s quite clear that the ferocious jaws of the media and the fierce claws of the minority are well up to the annihilation of the whole civilization of the Indian subcontinent. Wake up; wake up from your slumber! The “secularism” is a sharp-edged dagger handed over to you to cut your own root.